I totally stole the name of this post from my friend’s Facebook post. 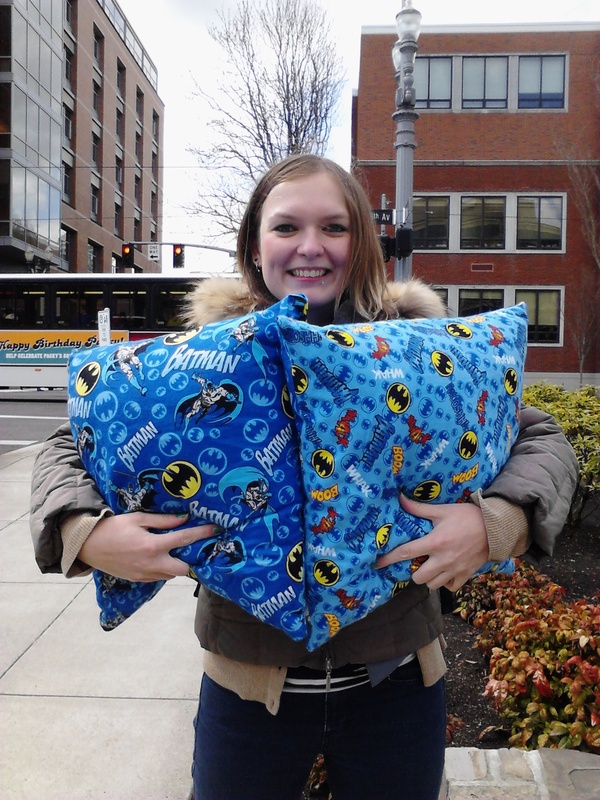 She just recently got a Batman themed tattoo right before her birthday this year and I decided to keep up the theme by making her Batman pillows! I found it was actually cheaper to buy couch pillows from Ross than it was to buy uncovered pillows. It doesn’t matter if they’re super ugly, because you’re going to take off the outside anyway. 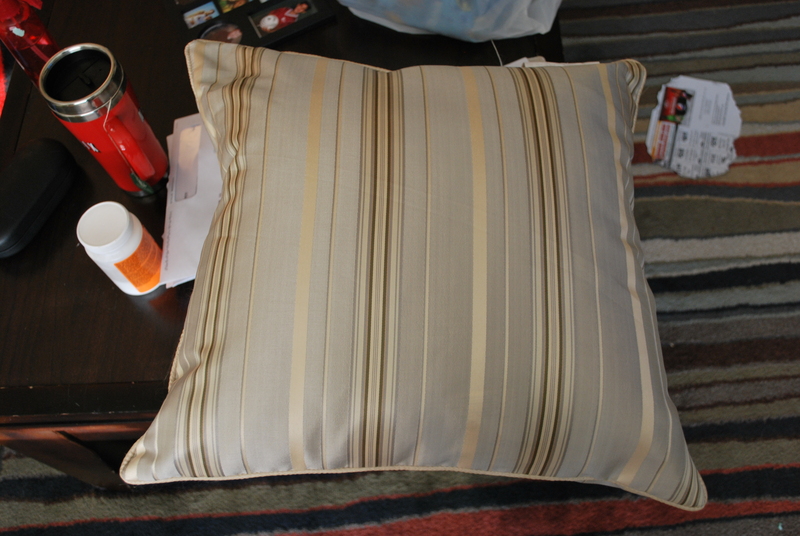 Step 1: Strip that ugly pillow! 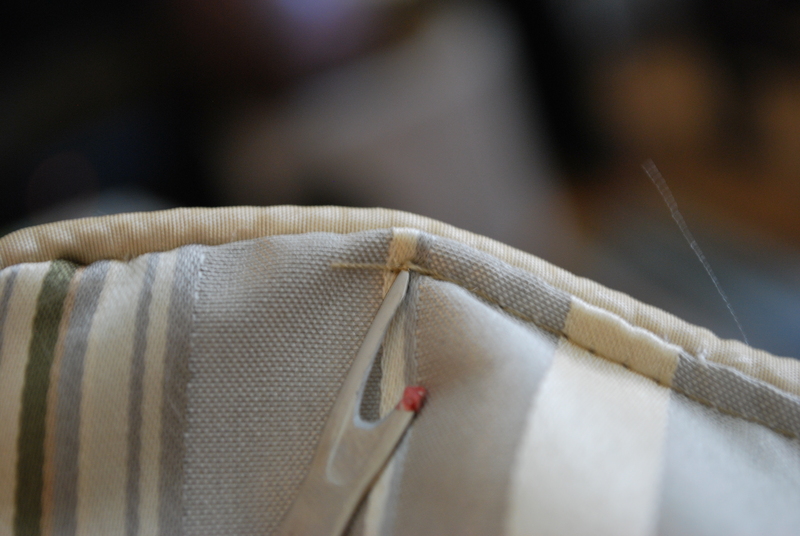 Find where it’s sewn shut and use your seam ripper to gently take out the seam. Once the opening is big enough, yank out the innards. Lex was trying to be especially helpful on this project, which I thought was funny because my friend is not a huge cat fan. I think he knows it and was doing it on purpose. I know you’re going to want to toss that ugly fabric right away, but resist! We need it for the next step. 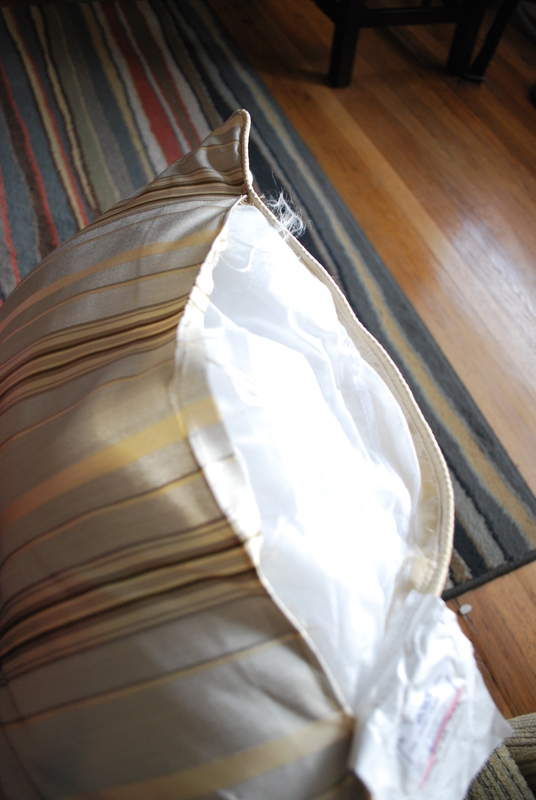 Step 2: Lay your fabric under the ugly pillow cover so you can use it as your pattern. (Yay! No measuring!) 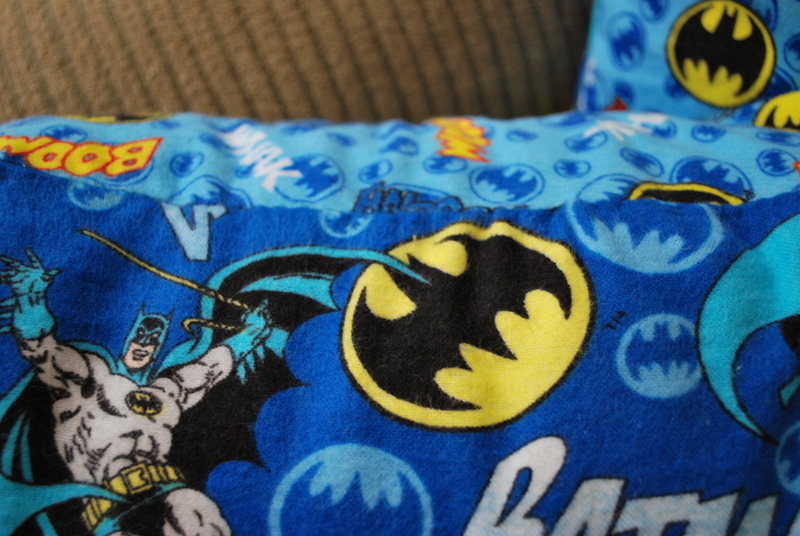 Now you can just trim any of the Batman fabric that’s sticking out. 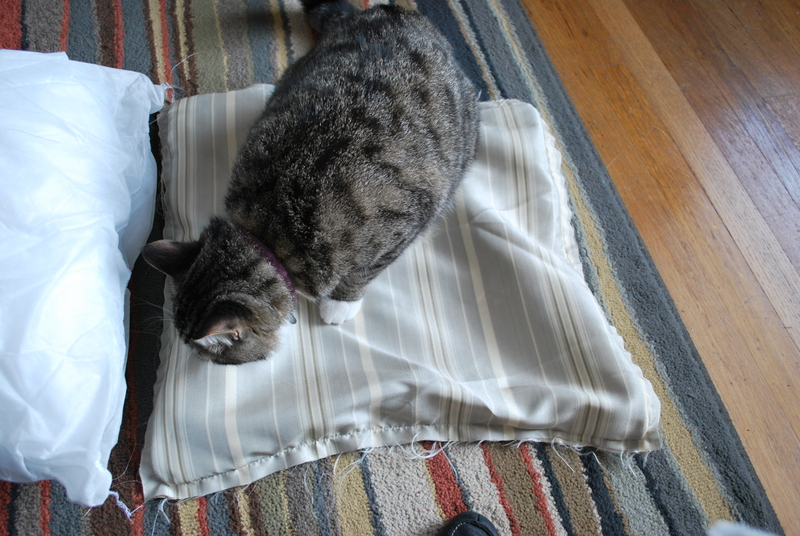 Step 3: I know you’re getting anxious to use the sewing machine, but slow down cowgirl! First we need to make sure all of our fabric is ready. 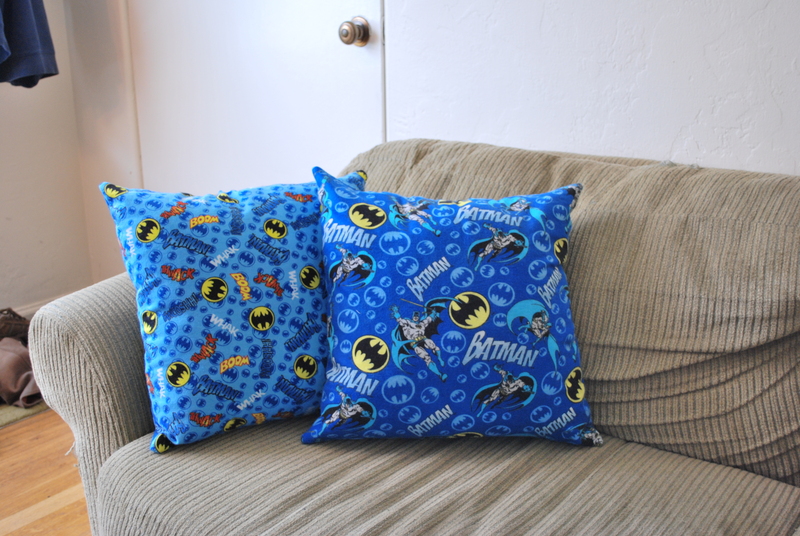 I wanted to make my pillows two sided, so I used one Batman fabric for one side, and the other for the back. This way my friend can mix and match them. Stack your two fabrics on top of each other right side facing in. Now you get to pin all around the edges. 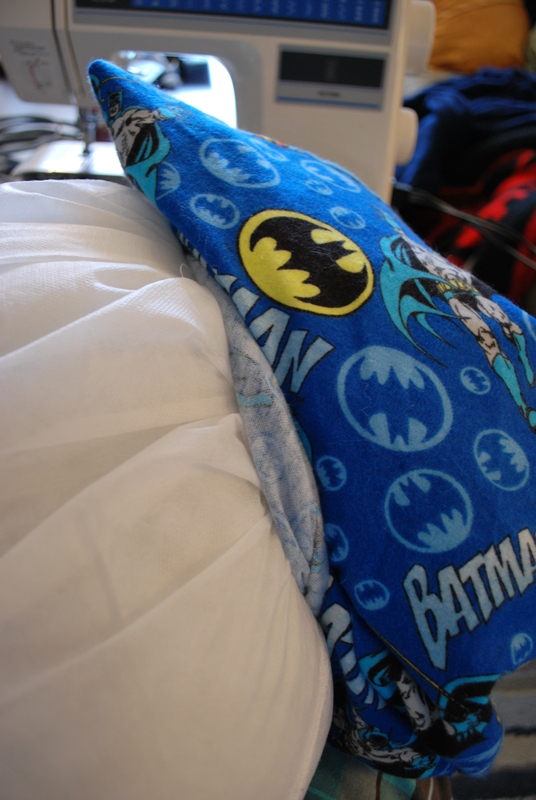 And don’t forget to put a mark where you need to stop so you can turn it inside out and fit the pillow through! I would say that I left about a ten inch opening. I hate pinning and try to put in as few pins as possible. Remember in Family and Consumer Science class you learned to always pin the middle before pinning the outsides? Totally didn’t do that. 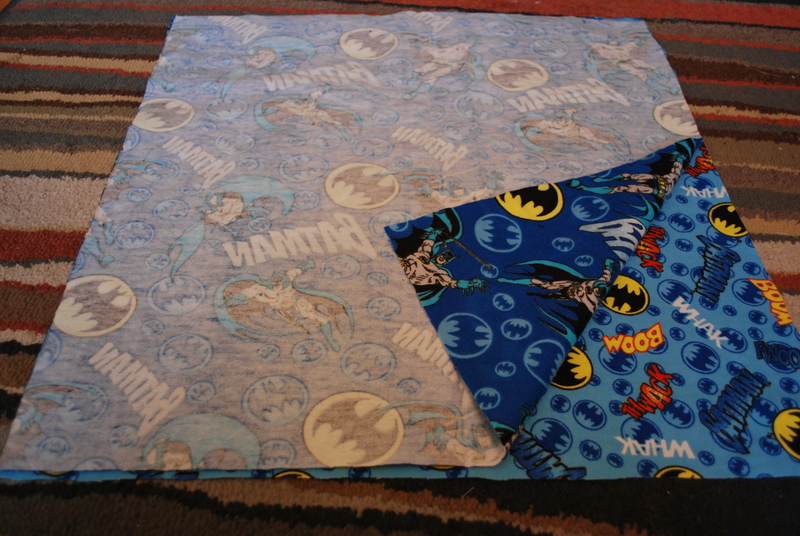 Things didn’t match up quite as well when I sewed and I ended up with some unwanted pleats. Listen to your teachers from middle school, seriously. 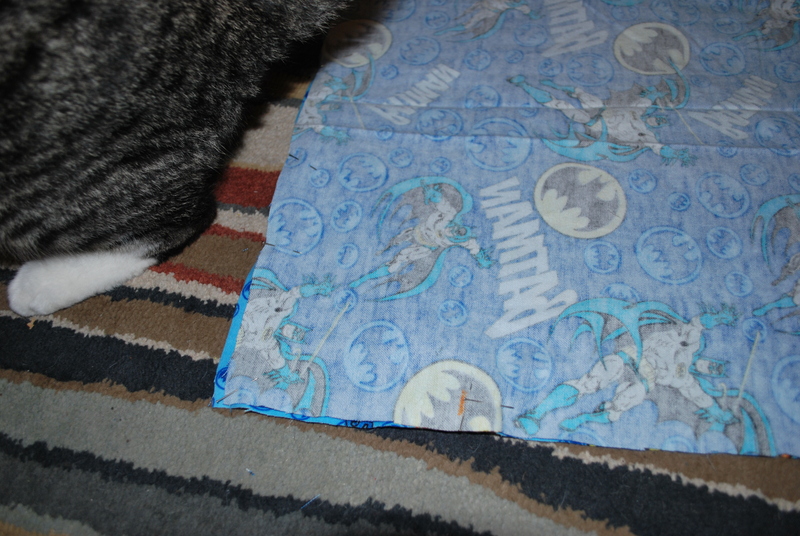 Step 4: Time for sewing, finally! To make a really clean corner what you’ll want to do is, while the needle is in through the fabric, lift up your presser foot and turn the fabric 90 degrees. 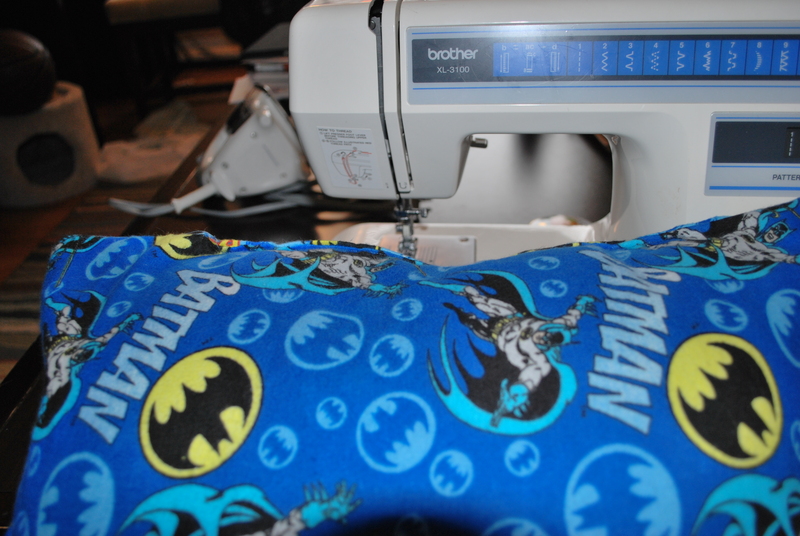 Then you can continue sewing without having to break the line. Before proceeding any further, make sure your pillow fits inside your new casing. Make any adjustments as needed. 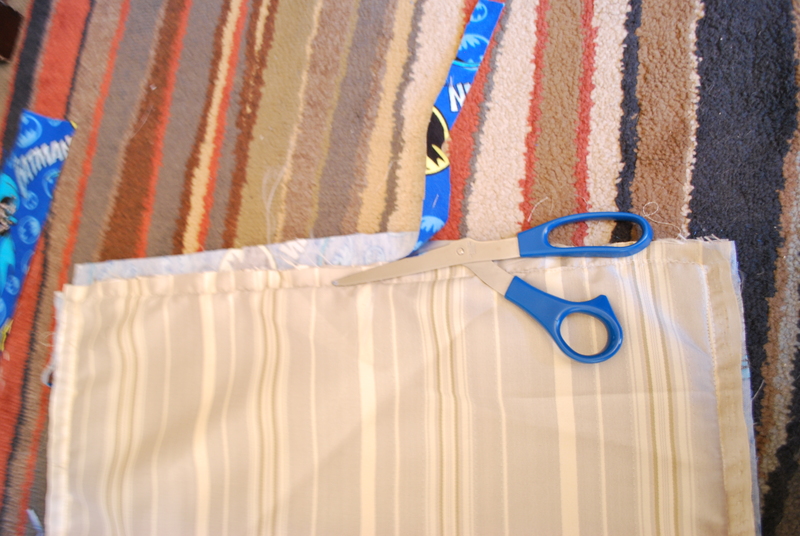 At the opening, fold the excess fabric inside of the pillow case and pin it. You’re not pinning the opening closed yet, just pinning it back in on itself. Do both sides. 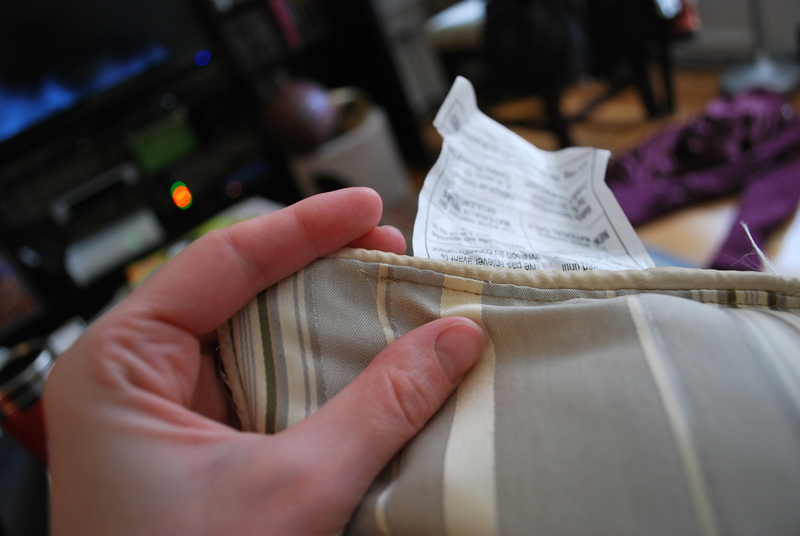 Once it’s pinned, go ahead and iron the whole thing, making sure to crease the folds at the opening. Sooooooo… I tried a couple different things to close the opening that we left… Let’s say the first attempt didn’t work out too well. I thought I’d be clever and save some time and just use my sewing machine to sew over the opening. The ugly pillow did it and it looked okay! Yeah… it’s pretty frackin’ terrible looking. 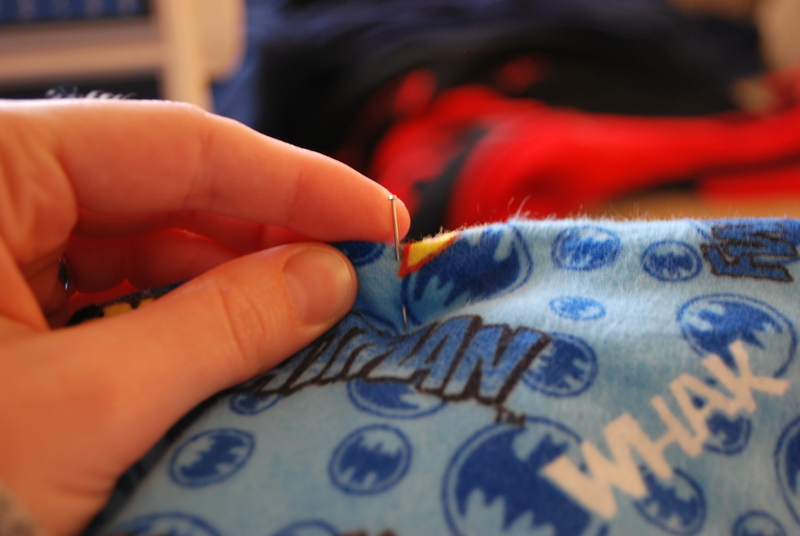 Pull out your trusty seam ripper and take 20 minutes to undo what you did to try to save time. Face it, you need to hand sew the opening. This is why they have marathons of 16 & Pregnant on MTV for you to sit in front of today. 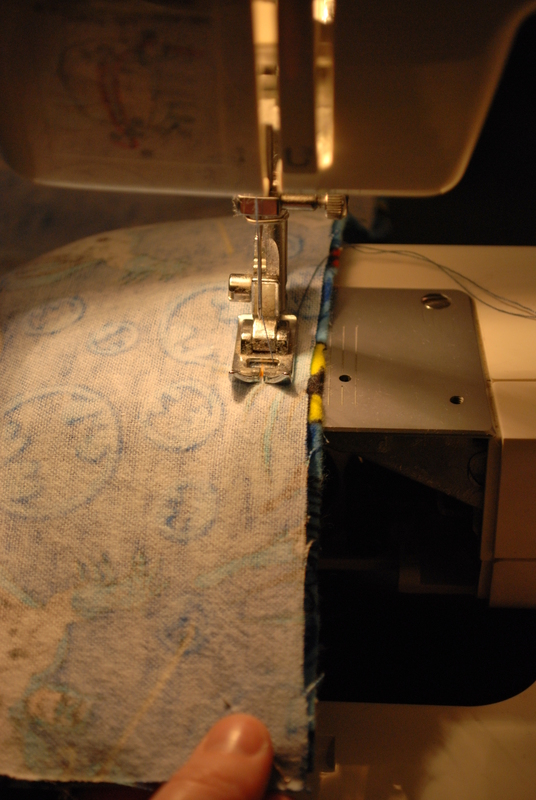 Use a hidden stitch so that the seam won’t be visible. Voila! You’re done and have an awesome home-made birthday present to give to your friend! I love them!! 😀 They make my couch look 10x cooler.